This is the first post in my new series, "A Look Back". In this series, I take 'a look back' at an artwork or series of artworks I made in the past. I include a brief backstory, and attempt to isolate what I like (if anything) about the piece / pieces. Whatever it is I like about the work I consider 'my takeaway', these are the elements I'd like to incorporate into and move forward with in my current work. After getting married, my husband Bob and I backpacked through Asia for 8 and a half months. Back then, before kids, we'd sit and enjoy a beautiful place for hours, him with his little travel guitar and me with my sketchbook. 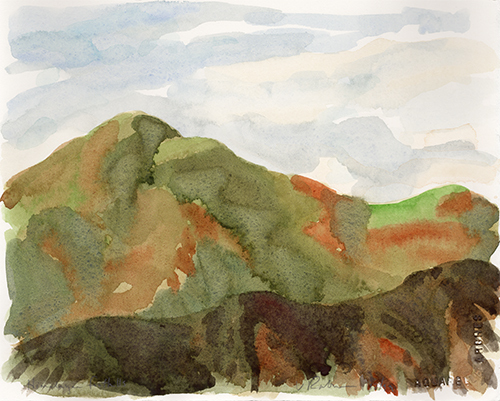 Today I'm taking a look back at some watercolor landscapes I made at that time. I almost always bring my watercolors with me when I travel. It's a great way for me to relax and enjoy the new environment. Each of these paintings were made outdoors from observation. They most likely took about an hour to complete. Today, if I'm traveling, it's rare that I have an hour to paint without interruption (that's motherhood!) so it's been a while since I've attempted to paint the landscape. With the changing light, it's something I prefer to finish in one sitting so I'm not returning to a subject thats gone and changed on me. Here's my takeaway: If my aim is to create peace-inducing artworks, these paintings contain a palette I can refer back to. 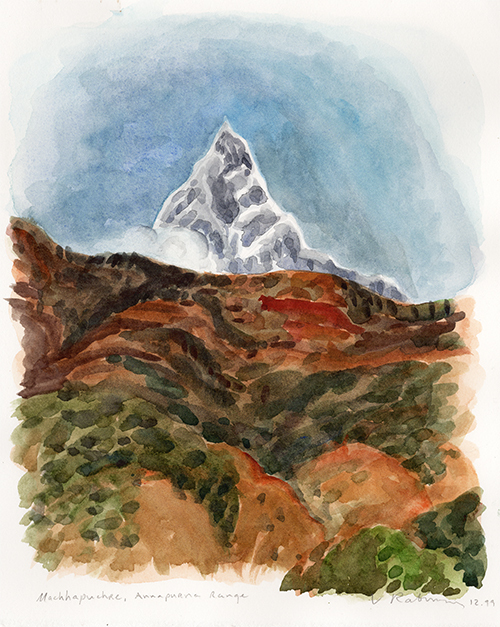 Also, watercolor landscapes are a great way to relax, but stylistically, there's nothing here that I'd necessarily choose to fold back into my current work. I'm going to hang onto these paintings. Once I get around to framing them, I'd like to hang them in our bedroom. They'll help create the relaxing atmosphere I'm going for in that space, and remind my husband and I of our amazing journey through Asia.